We describe a protocol for real-time videoimaging of neuronal migration in the mouse forebrain. The migration of virally-labeled or grafted neuronal precursors was recorded in acute live slices using wide-field fluorescent imaging with a relatively rapid acquisition interval to study the different phases of cell migration, including the durations of the stationary and migration phases and the speed of migration. Khlghatyan, J., Saghatelyan, A. Time-lapse Imaging of Neuroblast Migration in Acute Slices of the Adult Mouse Forebrain. J. Vis. Exp. (67), e4061, doi:10.3791/4061 (2012). There is a substantial body of evidence indicating that new functional neurons are constitutively generated from an endogenous pool of neural stem cells in restricted areas of the adult mammalian brain. Newborn neuroblasts from the subventricular zone (SVZ) migrate along the rostral migratory stream (RMS) to their final destination in the olfactory bulb (OB)1. In the RMS, neuroblasts migrate tangentially in chains ensheathed by astrocytic processes2,3 using blood vessels as a structural support and a source of molecular factors required for migration4,5. In the OB, neuroblasts detach from the chains and migrate radially into the different bulbar layers where they differentiate into interneurons and integrate into the existing network1, 6. In this manuscript we describe the procedure for monitoring cell migration in acute slices of the rodent brain. The use of acute slices allows the assessment of cell migration in the microenvironment that closely resembling to in vivo conditions and in brain regions that are difficult to access for in vivo imaging. In addition, it avoids long culturing condition as in the case of organotypic and cell cultures that may eventually alter the migration properties of the cells. Neuronal precursors in acute slices can be visualized using DIC optics or fluorescent proteins. Viral labeling of neuronal precursors in the SVZ, grafting neuroblasts from reporter mice into the SVZ of wild-type mice, and using transgenic mice that express fluorescent protein in neuroblasts are all suitable methods for visualizing neuroblasts and following their migration. The later method, however, does not allow individual cells to be tracked for long periods of time because of the high density of labeled cells. We used a wide-field fluorescent upright microscope equipped with a CCD camera to achieve a relatively rapid acquisition interval (one image every 15 or 30 sec) to reliably identify the stationary and migratory phases. A precise identification of the duration of the stationary and migratory phases is crucial for the unambiguous interpretation of results. We also performed multiple z-step acquisitions to monitor neuroblasts migration in 3D. Wide-field fluorescent imaging has been used extensively to visualize neuronal migration7-10. Here, we describe detailed protocol for labeling neuroblasts, performing real-time video-imaging of neuroblast migration in acute slices of the adult mouse forebrain, and analyzing cell migration. While the described protocol exemplified the migration of neuroblasts in the adult RMS, it can also be used to follow cell migration in embryonic and early postnatal brains. Neuroblasts can be visualized using transgenic mice that selectively express fluorescent proteins in neuroblasts (i.e., Dcx-GFP, Gad67-GFP), by stereotaxically injecting viral particles encoding fluorescent proteins into the SVZ or RMS, or by grafting neuronal precursors from reporter mice (i.e., Dcx-GFP, Gad67-GFP) into the SVZ of wild-type mice. We describe the procedure for grafting and viral labeling of neuronal precursors. The following solutions are required for neuroblast dissociation. Anesthetize two- to three-month-old adult mouse expressing a fluorescent protein in neuroblasts with an intraperitoneal injection of 100 μl of ketamine/xylazine (10 mg/1 mg per 10 g of body weight), then decapitate. We use GAD67-GFP mice11. Using the scalpel, slice the brain coronally at the level of the lateral ventricle, and dissect out the SVZ in ice cold dissection medium. Place the SVZ in a microcentrifuge tube with 500 μl of trypsin-DNase solution, and keep on ice for 20 min. Transfer the SVZ into a 15 ml conical tube containing 5 ml of pre-warmed (37 °C) trypsin-DNase solution and incubate at 37 °C in a 5% CO2 for 30 min. Transfer the entire contents into a 50 ml conical tube containing 15 ml of trituration solution and centrifuge at 1,000 x g for 1 min. Aspirate the supernatant, add 10 ml of trituration solution, transfer the cells to a new 15 ml conical tube, and centrifuge at 1000 x g for 1 min. Fire-polish a Pasteur pipette to reduce the tip size and coat with trituration medium. Following centrifugation remove as much of the supernatant as possible, and add 2 ml of fresh trituration solution to the conical tube. Triturate the cells in the trituration solution (roughly 50 times up and down with Pasteur pipette). Take the upper half of the supernatant, which contains well dissociated cells, and transfer it into a new 15 ml conical tube containing 10 ml of trituration solution. Fire-polish a Pasteur pipette to reduce further the tip size. Add another 1 ml of trituration solution to the tube containing the remaining undissociated cells, continue the trituration (roughly 10 times up and down), and transfer the entire contents to the 15 ml conical tube containing previously dissociated cells. Centrifuge at 1,000 x g for 7 min. Discard the supernatant, re-suspend the pelleted cells in 50 ml of neurobasal medium, load into a counting chamber, and count the cells. Graft the desired number of cells into the SVZ using the procedure described below. Sterilize all the instruments using a bead sterilizer before starting the surgery. For stereotaxic injections, use glass micropipettes with very thin tips (1-2 μm) to minimize brain damage. To make a pipette, pull a glass capillary with a pipette puller. Backfill the pipette with paraffin oil until half-full, and insert the plunger of a Nanoliter injector (World Precision Instruments) into the untreated end of the pipette. Using a Nanoliter injector controller, force the oil downwards with the plunger until a small drop of paraffin oil extrudes from the thin tip. Lower the pipette into a sterile receptacle with 0.5-1 μl of a solution containing either viral particles (1x106-1x108 TU/ml) or dissociated SVZ cells. Use the withdraw function of the Nanoliter injector to fill the pipette with the desired solution. Make sure there are no air bubbles inside the pipette. Anesthetize two- to three-month-old adult C57Bl/6 mouse with an intraperitoneal injection of ketamine/xylazine. Use an electric razor to shave the surgical site on the head. Clean well with wet gauze to remove any adherent hair. Place the mouse on a stereotaxic frame and fix the head. Wash the hair-free injection site with disinfectant soap (Hibitane) and then with 70% alcohol (gauze or spray). Disinfect the site with Proviodine (gauze or spray) and cover the animal with a surgical field. Make a small incision in the sterilized skin of the mouse, and carefully spread the skin to expose the underlying skull. Dry the surface of the skull. Use the bregma and midline as the zero coordinates to set the anterio-posterior (AP) and medio-lateral (ML) stereotaxic coordinates, respectively. Drill a small hole in the skull over each hemisphere at the appropriate coordinates. Avoid damaging the underlying brain tissue. Drill carefully until only the bone has been breached. Clean the hole and set the zero coordinates for the dorso-ventral (DV) stereotaxic coordinates on the surface of the brain. We use following coordinate (in mm) for injections into the SVZ or RMS of adult (22-24 g) C57Bl/6 mice: for SVZ: AP 0.70, ML 1.20 and DV 1.90; for RMS: AP 2.55, ML 0.82 and DV 3.15. Slowly insert the glass micropipette tip into the brain using the appropriate DV coordinates as guides, and slowly inject a small amount (we inject 100-500 nl at 5 nl/sec) of cell suspension (dissociated from the SVZ of reporter mice) or a solution containing viral particles. We usually use lentiviral or retroviral particles 1x106-1x108 TU/ml. Slowly withdraw the glass micropipette, suture the skin over the skull, and place the mouse on a heating pad for faster recovery. When the mouse wakes up after the surgery, administer an analgesic (ketaprofen 10 mg/kg, SC, 1 injection per day during 3 days post-op). The following solutions are required to prepare acute slices: a) an artificial cerebro-spinal fluid (ACSF) sucrose-based solution, hereinafter referred to as cutting solution, where NaCl is replaced by sucrose to dampen increased neuronal excitability during the slice preparation procedure, and b) ACSF containing NaCl, warmed to 32 °C in a water bath, into which the slices are transferred and maintained until imaging. The solutions contain the following (in mM): cutting solution: 210.3 sucrose, 3 KCI, 1.3 MgCI2x6H2O, 2 CaCI2x2H2O 26 NaHCO3, 1.25 NaH2PO4, 20 glucose; ACSF: 125 NaCI, 3 KCI, 1.3 MgCI2x6H2O, 2 CaCI2x2H2O, 26 NaHCO3, 1.25 NaH2PO4, 20 glucose. Maintain the solutions at a pH of 7.3-7.4, and continually oxygenate by bubbling them with 95% O2/5% CO2. Anesthetize the mouse with an intraperitoneal administration of ketamine/xylazine. Prepare ice-cold cutting solution with a jelly-like appearance using liquid nitrogen. Perfuse the mouse intracardiacaly with this solution using a 20-cc syringe. This procedure should be performed quickly, usually 1-2 min for 20 ml of solution. If the blood vessels need to be labeled, instead of perfusing with the cutting solution, inject transcardiacally 200 μl of Dextran Texas Red (10 mg/ml) into the left ventricle of the heart and wait 2-3 min before decapitating the mouse. Decapitate the mouse, and rapidly immerse the head in ice-cold cutting solution. Use the scissors to remove the scalp, and cut the skull from the posterior to anterior axis along the mid-sagital suture from the cerebellum to the OB. Gently remove the cranial flaps using forceps. Excise the caudal part of the brain using a scalpel. Cut the brain along the intrahemispheric fissure, and make two sagittal cuts on the most lateral part of each hemisphere (Figure 1A). Gently remove the brain using a spatula, and place it in ice cold cutting solution. Place the two hemispheres separately on a 4% agar block with the dorsal side touching the agar, and glue the block with the two hemispheres to the platform of a vibratome. Glue the laterally cut side of the hemisphere to the platform, keeping medial side facing up (Figure 1B). Place the platform in the chamber of the vibratome and fill it with cutting solution. Keep the solution oxygenated throughout the slice preparation by bubbling it with 95% O2/5% CO2. Prepare 250 μm thick sections using the vibratome. We use a Microm HM 650 V vibratome (Thermo Scientific) and cut the slices at a frequency of 100 Hz and a speed of 1 mm/sec. A low cutting speed and high frequency blade vibration should be used to obtain high quality sections. As soon as a slice is released from the blade, gently remove it from the cutting solution and place it in an incubation chamber filled with oxygenated ACSF maintained at 32 °C in a water bath (Figure 1C). This procedure should be performed as quickly as possible to ensure the best quality slices. The imaging of migrating neuroblasts should be performed within 6-8 hr of the preparation of slices and 3-10 days after neuroblasts labeling. To avoid changes in migration parameters because of stereotaxic injection that might induce brain damage and glial activation use thin-tipped glass microelectrodes (1-2 μm) to minimize the brain damage, and perform the imaging in the regions distal from the site of injection (i.e. image in the RMS following injection into the SVZ or in the RMS of olfactory bulb following injection into the RMS). Although the imaging can be performed up to 21 days after injection of lentiviral particles into the SVZ, we recommend shorter post-injection interval (3-10 days) since it allows visualizing and tracking more cells per field of view. We used a wide-field fluorescent motorized BX61WI microscope (Olympus) equipped with a CCD camera (CoolSnapHQ2, Photometrics) and a 40X water immersion objective with a 0.8 numerical aperture (Olympus). The objectives with higher NA will provide better resolution images. Labeled neuroblasts (grafted either from a reporter donor mouse or virally labeled) were excited with a Lambda DG-4 equipped with a 175 W xenon lamp (Sutter Instruments) for 30-100 msec per z acquisition. Multi-wavelength imaging can be also performed using appropriate filter sets (Chroma) to track neuronal migration along the other cellular elements of the RMS, such as fluorescently labeled astrocytes or blood vessels. The microscope, CCD camera and DG-4 were controlled by MetaMorph software (Molecular Device) that allowed the different parameters of time-lapse acquisition program to be set (see below). The slices were transferred to a PH1 Series 20 ultra-quiet imaging chamber (Harvard Apparatus) built on the microscope. The chamber was connected to an automatic heating system (TC-344B, Harvard Apparatus) and was continuously perfused with oxygenated ACSF (Figure 1D). The temperature in the chamber was maintained at 31-33 °C, and the flow rate of the ACSF was 1-2 ml per min. Carefully place the slice in the imaging chamber of the microscope. To avoid drifting of slice during imaging, stabilize it by carefully placing a nylon mesh (Warner Instruments) on top of the slice. The mesh is 0.12 mm thick and the openings range from 0.3 to 1.13 mm. Position the mesh so that it does not obstruct the imaging field (Figure 1D). Use a 10X objective to find a field of interest, and then engage the 40X objective and adjust the focus. Make sure that the slice is continuously perfused with ACSF and that there is enough solution between the objective and the slice. Changes in the rate of ACSF perfusion, irregular perfusion, or drastic temperature variations causes drifting and changes in the focal plane during imaging. Set the time-lapse acquisition parameters (i.e. duration of excitation, the number of z planes, distance between each z-section, time interval, and duration of the recording) using the MetaMorph software, which controls the acquisition system and start the time-lapse acquisition. Data is automatically saved by MetaMorph as a tiff files with each file corresponding to one time point of the acquired time-lapse video. Perform the imaging for at least 1-2 hr and take into consideration migratory phases that are interrupted by two stationary phases. The imaging can be performed for up to 4 hr (we did not perform imaging sessions lasting more than 4 hr) without any alterations in the migration properties of the neuroblasts. Do not image cells at the surface of the slice. We usually image at a depth of 20 to 100 μm. We recommend using short acquisition intervals (15 - 30 sec) to reliably determine the beginning and end of the stationary and migration phases. To assess the involvement of specific molecular factors in the migration of neuronal precursors, normal ACSF can be substituted with ACSF containing any desired pharmacological agent (i.e., different agonists, antagonists, blockers, growth factors, etc.). Perform imaging for at least 1 hr in control condition and then for 1 hr in the presence of the pharmacological agent. We use Imaris software (Bitplane) to analyze the data. This allows us to automatically track newborn cell migration in 3D. The Imaris 7.0F1 package includes the MeasurementsPro, Imaris Tracking, ImarisColoc, ImarisXT, Filament Tracer, and InPress modules. To open the movie in Imaris, load the acquired images (tiff files) by simply dragging and dropping the image of the first time point of the video on the program icon. Once the movie is loaded, adjust the brightness and contrast of the signal in the Display adjustment window, and set the parameters of the acquired video (voxel size and time interval) in the Image properties and Set equidistant time points windows (Fig. 4A). After specifying the voxel size, it is possible to see the frame in 3D as well as the time and scale of the video. To automatically track recorded cells, create a spot for each cell in the field in the Surpass window by choosing the Spots function. Follow the steps, and set the parameters based on the imaged objects (Figure 4B). One of the parameters is the diameter of the cell that can be measured in the Slice window. Inspect the reliability of the detected objects over time. If all the migrating cells are not automatically detected, change the threshold of detection (Figure 4B), and make sure that all cells have been selected with spots at all time points. During automatic tracking, if two objects from neighboring time-points have any overlap between their borders/edges, a track connection will be made for each overlap. The maximum distance and maximum gap size (Figure 4C) between two spots representing neighboring time points of the same track have to be specified so that the program can connect the time points. The maximum distance is determined by the distance between the same object at subsequent time-points. 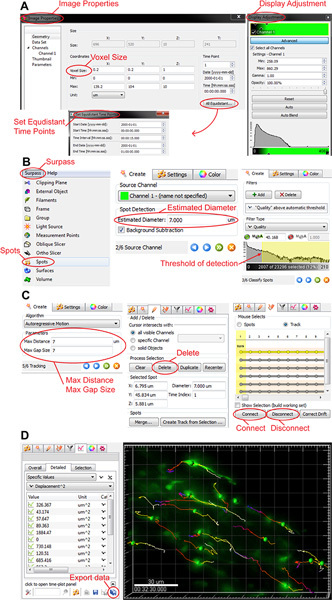 Once the tracks are made, it is possible to filter the tracks and remove irrelevant tracks by simply deleting them (Figure 4C). Tracks can be corrected by connecting and disconnecting different tracks and different time points of the same track (Figure 4C). 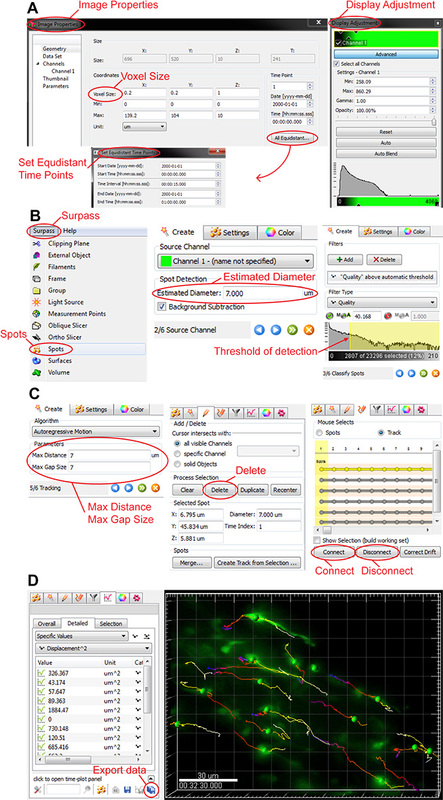 Once all corrections have been made, take a final look at the tracks and export the data (cell displacement per time point, track length, displacement length, track duration etc.) to an Excel file (Figure 4D). We tested and optimized wide-field time-lapse imaging of neuroblast migration. Viral labeling or grafting of fluorescently labeled neuroblasts into the SVZ allowed for robust GFP expression in migrating cells (Figure 2). 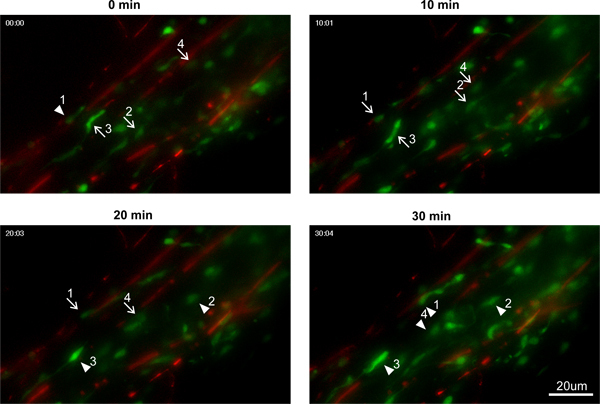 Multi-wavelength imaging can be applied to visualize neuroblast migration along other cellular elements of the RMS such as dextran TexasRed-filled blood vessels4 (Figure 3 and Movie 1), astrocytes fluorescently labeled by stereotaxic injection of viruses with a glial cell specific promoter (Figure 2B)12, or specifically labeled astrocytes in transgenic animals. Wide-field video-imaging of neuroblast migration in acute slices revealed the saltatory behavior of migrating neuronal precursors composed of two distinct phases: displacement of the neuronal cell body towards the leading process separated by a stationary phase (Figure 3, Movies 1 and 2). To reliably identify the duration of the stationary and migratory phases and to derive other cell migration parameters such as the rate of displacement (calculated only during the migration phases), imaging was performed in 3D using a short acquisition interval (once per 15 or 30 sec). The precise identification of the durations of the stationary and migration phases is crucial for the unambiguous interpretation of data. For example, differences in the distance of migration during a given time period can be induced either by changes in the rate of the migration or by modifications in the duration or periodicity of the migration and stationary phases. These different possibilities cannot be distinguished using long acquisition intervals. Imaris software was used to analyze the migration of neuroblasts in 3D and to derive additional parameters of cell migration such as track duration and track length, as well as track displacement length, which is a vector of displacement. The track straightness can be also calculated by dividing the track length by the track displacement length and it indicates the straightness of the migrating route of individual neuroblast. Figure 1. Schematic representation of the preparation of acute live slices. A) Schematic representation of one caudal, one intrahemispheric and two sagittal cuts. 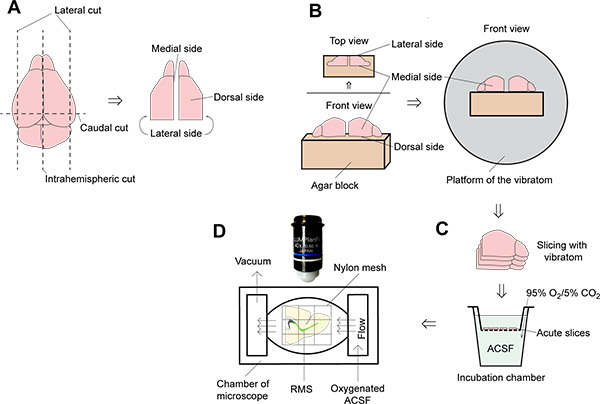 B) Schematic representation of placing the mouse brain on the agar block and platform of the vibratome. C) Schematic representation of acute slice incubation chamber. D) Schematic representation of the imaging chamber built on the upright microscope. Figure 2. Labeling of neuroblasts in the RMS. A) Low magnification image showing robust labeling of neuroblasts and blood vessels in the adult RMS. A retrovirus encoding GFP was injected into the SVZ, and GFP-expressing cells (green) were detected in the RMS after 3 days (left panel). 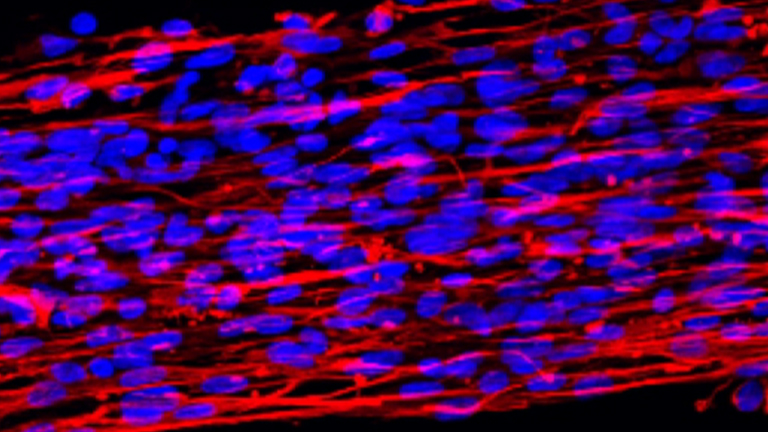 Blood vessels were labeled by injecting dextran TexasRed into the heart of the mouse (red, right panel). The inset shows a high magnification image of blood vessels and virally labeled neuroblasts associated with blood vessels. B) Labeling of different cellular elements in the adult RMS. Neuroblasts were labeled by injecting mCherry-encoding lentivirus in the SVZ (red), astrocytes were labeled by injecting a lentivirus encoding GFP under the control of a GFAP promoter in the RMS (green), and blood vessels were labeled by injecting Dextran CascadeBlue (blue) in the heart. C) Schematic representation of the injection of GAD67-GFP cells dissociated from the SVZ of a GAD67-GFP mouse into the SVZ of an adult wild-type mouse. D) Transplanted GAD67-GFP cells (green) detected in the RMS 7 days after grafting in the SVZ. The RMS is immunostained with GFAP (blue). E) Transplanted GAD67-GFP cells (green) were immunopositive for Dcx (red), but were immunonegative for GFAP (blue). Click here to view larger figure. Figure 3. Time-lapse imaging of neuroblasts. Time-lapse imaging of neuroblast (green) migration along blood vessels (red). The arrows indicate the migration phases of the neuroblasts, and the arrowheads indicate the stationary phases. Figure 4. Analysis of neuroblast migration. (A-D) Different steps of neuroblasts migration analysis. The red circles indicate the different functions mentioned in the text. Click here to view larger figure. Video 1. Time-lapse imaging of virally labeled neuroblasts (green) migrating along dextran TexasRed labeled blood vessels (red). Click here to view video. Video 2. Tracking neuroblast migration by Imaris software. Green dots indicate cell bodies and tracks indicate the distance of migration. Click here to view video. The correct targeting of neuronal precursors to the appropriate brain regions is a fundamental process underlying the proper assembly and function of neural circuitry. The vast majority of cells migrate during embryonic development and in the postnatal brain only in a few regions, such as the OB, dentate gyrus and cerebellum, neuronal displacement still takes place. The mechanisms orchestrating cell migration in the postnatal brain remain, however, poorly understood. Knowledge of the mechanisms and molecular pathways involved in guiding cell migration in mature nervous tissues will improve our understanding of neuronal targeting in the postnatal brain and may have clinical relevance for the development of new strategies to induce neuronal recruitment into diseased areas of the brain. In this manuscript, we describe a protocol for monitoring cell migration in acute slices of the adult mouse forebrain. While we used the adult SVZ-OB pathway as a model system, the same technique can be applied to follow cell migration in the embryonic and early postnatal brains as well as in the adult brain following injury. We used this protocol to follow cell migration in the early postnatal RMS12, cerebellum and adult post-stroke striatum (Eiriz, Grade, Malva and Saghatelyan, unpublished data) . Imaging of neuroblast migration was performed using acute live slices that allow cell migration to be studied in a microenvironment that closely mimics in vivo conditions. Migrating cells were visualized either by stereotaxic injections of viral particles or by grafting neuroblasts from reporter mice into the SVZ of wild-type mice. The migration analysis was performed far from the injection site. To study tangential migration in the RMS, we prepared acute slices 3-5 days after the neuroblasts were labeled. To study radial migration in the OB, the slices were prepared 7-10 days after a stereotaxic injection into the SVZ. Viral targeting of neuronal precursors in the adult SVZ can be also used to study and modulate factors involved in the migration process by upregulating or downregulating specific molecular cues. It is also possible to label different cell types in the RMS and perform multi-wavelength imaging to unravel the pattern of neuroblasts migration along tracer filled blood vessels4, 13 or along virally or genetically labeled astrocytes2, 12. To image neuroblast migration we used a motorized fluorescence upright microscope equipped with a CCD camera that allowed relatively rapid acquisitions at different z planes following short pulses (30-100msec) of excitation light. This prevented photobleaching and decreased the time interval between two subsequent acquisitions without interfering with the 3D visualization of neuroblast migration. Other groups have used confocal or two-photon microscopes to monitor cell migration in the postnatal RMS14-16. Both techniques have their advantages and limitations, which are mainly related to temporal and spatial resolutions issues. We recommend using short intervals (15-30 sec) between successive acquisitions. Newborn neurons have saltatory behavior, and migration phases are interrupted by stationary periods that can be as brief as 4-10 min4. Given this type of migration, it is important to use relatively rapid acquisition intervals (15-30 sec) between successive time points to reliably identify the beginning and end of migration and stationary phases. This is difficult to achieve when the time interval between two successive acquisitions is in the range of several minutes. A precise determination of the stationary and migration phases is required to unambiguously define the speed of neuroblast migration, which should be quantified only during the migration phases4, 17. Long acquisition intervals allows to calculate the average speed as the distance traveled over a certain period of time that also includes stationary phases. Changes in the average speed defined by this method, however, can be caused either by differences in the rate of migration (defined only during migration phases) or by the duration of the stationary and migration phases. These differences in acquisition parameters are likely to underlie the discrepancies in the speeds of neuroblasts migration reported by different groups. By performing rapid acquisitions with a 15-30 sec interval and determining the rate of migration exclusively during the migration phases, we calculated a speed of migration of 120-150 μm/h4, 12, whereas other groups, who use an acquisition interval of 3-7 min reported a speed of 50-100 μm/h14, 15, 18. The main drawback of wide-field fluorescent imaging with CCD cameras is that it provides lower spatial resolution than scanning systems. However, since migrating neuroblasts have a compact morphology with soma and short leading processes, a lower spatial resolution does not preclude the reliable identification and tracking of neuroblasts at the level of cell bodies and even leading processes (Figure 3 and Videos 1 and 2). The technique we describe herein allows neuroblast migration in a microenvironment closely mimicking in vivo conditions to be analyzed, the interactions between different components of the RMS to be studied, and the roles of these interactions in neuroblast migration to be investigated. This work was supported by a Canadian Institutes of Health Research (CIHR) grant to A.S. J.K was partially supported by a Université Laval fellowship. A.S. is the recipient of a Canada Research Chair in postnatal neurogenesis. Kriegstein, A., Alvarez-Buylla, A. The glial nature of embryonic and adult neural stem cells. Annu. Rev. Neurosci. 32, 149-184 (2009). Kaneko, N. New neurons clear the path of astrocytic processes for their rapid migration in the adult brain. Neuron. 67, 213-223 (2010). Lois, C., Alvarez-Buylla, A. Long-distance neuronal migration in the adult mammalian brain. Science. 264, 1145-1148 (1994). Snapyan, M. Vasculature guides migrating neuronal precursors in the adult mammalian forebrain via brain-derived neurotrophic factor signaling. J. Neurosci. 29, 4172-4188 (2009). Whitman, M. C., Fan, W., Rela, L., Rodriguez-Gil, D. J., Greer, C. A. Blood vessels form a migratory scaffold in the rostral migratory stream. J. Comp. Neurol. 516, 94-104 (2009). Lledo, P. M., Saghatelyan, A. Integrating new neurons into the adult olfactory bulb: joining the network, life-death decisions, and the effects of sensory experience. Trends Neurosci. 28, 248-254 (2005). Bolteus, A. J., Bordey, A. GABA release and uptake regulate neuronal precursor migration in the postnatal subventricular zone. J. Neurosci. 24, 7623-7631 (2004). Martini, F. J., Valdeolmillos, M. Actomyosin contraction at the cell rear drives nuclear translocation in migrating cortical interneurons. J. Neurosci. 30, 8660-8670 (2010). Murase, S., Horwitz, A. F. Deleted in colorectal carcinoma and differentially expressed integrins mediate the directional migration of neural precursors in the rostral migratory stream. J. Neurosci. 22, 3568-3579 (2002). Wilcock, A. C., Swedlow, J. R., Storey, K. G. Mitotic spindle orientation distinguishes stem cell and terminal modes of neuron production in the early spinal cord. Development. 134, 1943-1954 (2007). 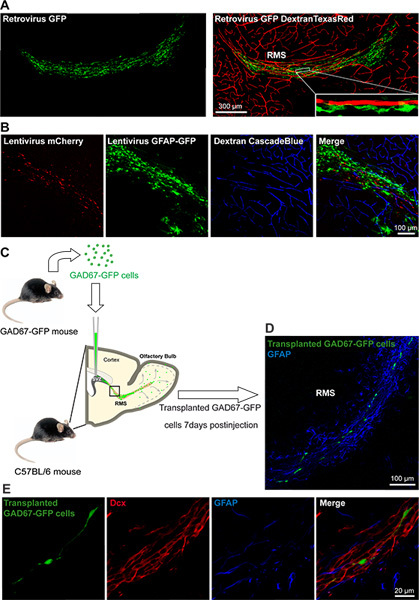 Ono, M., Yanagawa, Y., Koyano, K. GABAergic neurons in inferior colliculus of the GAD67-GFP knock-in mouse: electrophysiological and morphological properties. Neurosci. Res. 51, 475-492 (2005). Bozoyan, L., Khlghatyan, J., Saghatelyan, A. Astrocytes Control the Development of the Migration-Promoting Vasculature Scaffold in the Postnatal Brain via VEGF Signaling. J. Neurosci. 32, 1687-1704 (2012). Bovetti, S. Blood vessels form a scaffold for neuroblast migration in the adult olfactory bulb. J. Neurosci. 27, 5976-5980 (2007). Platel, J. C., Heintz, T., Young, S., Gordon, V., Bordey, A. Tonic activation of GLUK5 kainate receptors decreases neuroblast migration in whole-mounts of the subventricular zone. J. Physiol. 586, 3783-3793 (2008). Nam, S. C. Dynamic features of postnatal subventricular zone cell motility: a two-photon time-lapse study. J. Comp. Neurol. 505, 190-208 (2007). Kim, Y., Comte, I., Szabo, G., Hockberger, P., Szele, F. G. Adult mouse subventricular zone stem and progenitor cells are sessile and epidermal growth factor receptor negatively regulates neuroblast migration. PLoS One. 4, e8122 (2009). Bortone, D., Polleux, F. KCC2 expression promotes the termination of cortical interneuron migration in a voltage-sensitive calcium-dependent manner. Neuron. 62, 53-71 (2009). Comte, I. Galectin-3 maintains cell motility from the subventricular zone to the olfactory bulb. J. Cell Sci. 124, 2438-2447 (2011).